Michiganders gather for a rally in favor of Proposition 2 before the November election. Photo via Voters Not Politicians. 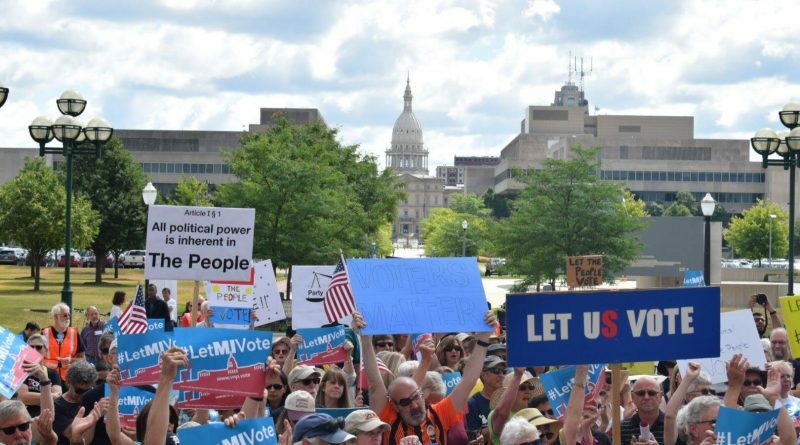 Following a massive grassroots operation started by one Michigan woman, Katie Fahey, voters in November overwhelmingly approved an amendment that aims to end gerrymandering by significantly changing the way the state draws its political lines. Now, as Michigan prepares to form its Independent Citizens Redistricting Commission after the 2020 U.S. Census, Voters Not Politicians—a nonpartisan, grassroots group that led the charge to pass the redistricting amendment—will hold a town hall meeting in Muskegon on Tuesday, March 26 from 6:30-8pm at Muskegon Community College’s Sturrus Technology Center, room 122. The Sturrus Technology Center is located at 388 W. Clay Ave. in downtown Muskegon. The “Democracy Reform Town Hall” will focus on the state’s new redistricting process and how people can participate in it. There will also be discussion of other democracy reform issues to strengthen the democratic process through citizen action in Michigan. Admission is free and all are welcome to attend, but space is limited and attendees are asked to RSVP. To RSVP, please click here. As part of the new process, the Independent Citizens Redistricting Commission will draw new political district lines beginning in 2021. The group is slated to be comprised of four Democrats, four Republicans, and five citizens who are not affiliated with either party. Advocates of the reform say the new commission will help to ensure more fairly drawn districts by transferring the redistricting power from state lawmakers to a citizen-led group. Following a redistricting process led by a GOP-controlled state legislature in 2001 and 2011, Michigan ended up with some of the most partisan voting districts in the country. “The Michigan Senate maps have more pro-Republican bias than 99.7 percent of all state Legislature maps across the country in the last 45 years,” Christopher Warshaw, a George Washington University political scientist, testified in February during a civil trial in U.S. District Court in Detroit that aims to determine whether Michigan’s political districts were drawn illegally in 2011, Bridge Magazine reported. Republicans have argued that Democrats sweeping the state in November’s election debunks the idea of illegal gerrymandering. Facing frustrations over the redistricting process in Michigan, Katie Fahey, now the executive director of Voters Not Politicians and a 2011 graduate of Aquinas College in Grand Rapids, in 2016 launched an effort to amend the state constitution to form the nonpartisan redistricting group. What started as Fahey’s Facebook post following the 2016 election turned into an all-volunteer effort to collect hundreds of thousands of signatures to put Proposal 2 on the ballot last November. 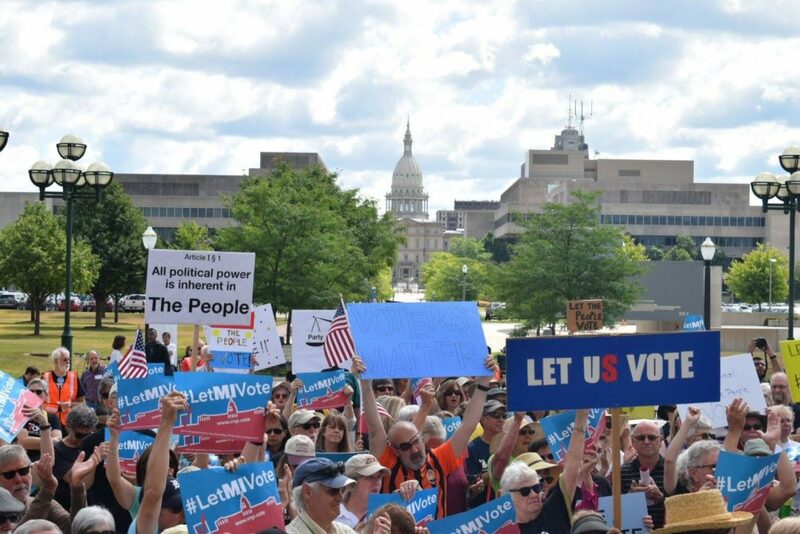 “The people of Michigan have been locked out of effective change-making opportunities, but we have the power, energy, and drive to create a solution that ends gerrymandering and reinvigorates the very spirit of our democracy,” Fahey said on the Voters Not Politicians website. For more information about the March 26 meeting, please click here.